A team of recent Arizona State University graduates and current students is among finalists for Entrepreneur Magazine’s 2012 College Entrepreneur of the Year Award. Called Vantage Realized, the eight-member team is developing a customized wheelchair designed to prevent injuries and physical ailments that often afflict long-term manual wheelchair users. The start-up venture has already earned the support of ASU Edson Student Entrepreneur Initiative, and last year finished second in the ASU Innovation Challenge in which student entrepreneurial projects compete for support. The co-founders of Vantage Realized are Gordon Freirich, who earned a degree in mechanical engineering from ASU’s Ira A. Fulton School of Engineering, JJ Tang, a finance graduate of ASU’s W. P. Carey School of Business, and Nick Gough, an industrial design major in the university’s Herberger Institute of Design and the Arts. Other members are graduates Ami Bui (marketing) Teddy Lewis (visual communication design), Colin Ho (mechanical engineering), Kris Guiang (biomedical engineering) and graduate student Wade Gyllenhaal (mechanical engineering). Vantage Realized is refining a method of propelling wheelchairs with the use of levers that produces less stress on the joints of users, who often develop infirmities such as carpal tunnel syndrome and rotator cuff injuries due to the physical strenuousness of using conventional manual wheelchairs. During the past summer the team built a prototype and worked with long-term wheelchair users to test its effectiveness. “We performed research to confirm that a lever system was physically better for the body,” says team member Ho. “Right now we are taking the feedback from our tests and developing a production-viable product,” Gyllenhaal says. The next step is to refine the product and develop a manufacturing plan to either sell the parts of the wheelchair separately or to partner with a company to develop wheelchairs with the parts as factory add-ons. 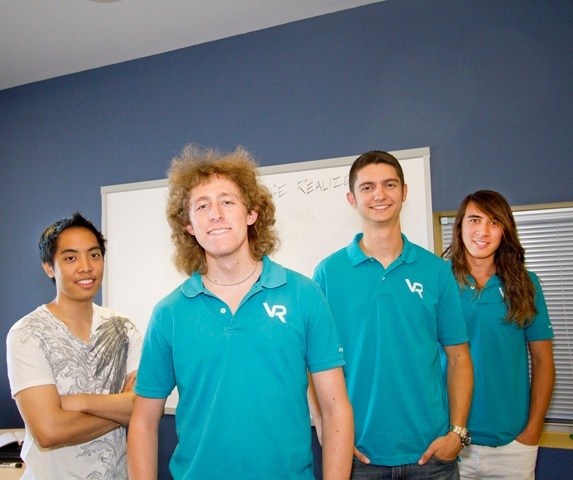 Vantage Realized is one of five teams vying for the Entrepreneur Magazine Award. A winner is to be announced in January and will be featured in an issue of the magazine. “We are confident in our project because it has a social value. It is not purely for profit,” Freirich says. “It’s always nice to win competitions, but it is not the bigger picture. We are much more concerned about what we actually achieve,” he says. The supportive environment of the Edson Initiative operations at SkySong, the ASU Innovation Center in Scottsdale, has helped boost Vantage Realized, Freirich says. “When you first get into the program the money seems really important, but the real benefits are the resources – the mentorship and the connections you make at SkySong,” he says. “It is a very open community. The other start-up companies are happy to share their connections and resources. We all work together,” he says. Read more about Vantage Realized, the College Entrepreneur of the Year Award and the Edson Student Entrepreneur Initiative. Visit the Vantage Realized website.